For versatility, it’s hard to beat the concrete floating platform. They provide foundations for stores, offices, yacht clubs, rowing club facilities, boat rental concessions, charter and cruise companies, customs offices, harbormaster offices, restaurants, bars, restrooms and houses. They serve as ferry and water taxi landings and create a platform for event space, rowing docks, swimming pools, helicopter landing pads, even floating golf greens, such as the 14th green at The Coeur d’Alene Resort in Idaho. The performance and endurance of concrete floating platforms is outstanding. They can be built with almost any freeboard and can be square, round, curved, sloped, stepped, notched and decked in any way the owner specifies. They support buildings of every style and building material. Floating platforms are limited only by the imagination. Many public and some private marinas invite the public to experience the waterfront. In a social-equality world, marina projects win public support by incorporating community activities and park areas and opening promenades and beaches to all. Alamitos Bay in Los Angeles, California, has done away with fences and security gates altogether. Floating platforms help make marinas more accessible. 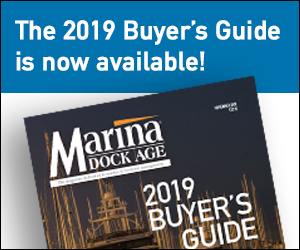 Marina and park complexes, such as Marina Park at Newport Beach or The Yards in Washington, D.C., provide romantic event venues, schools and classrooms, and places for family gatherings. 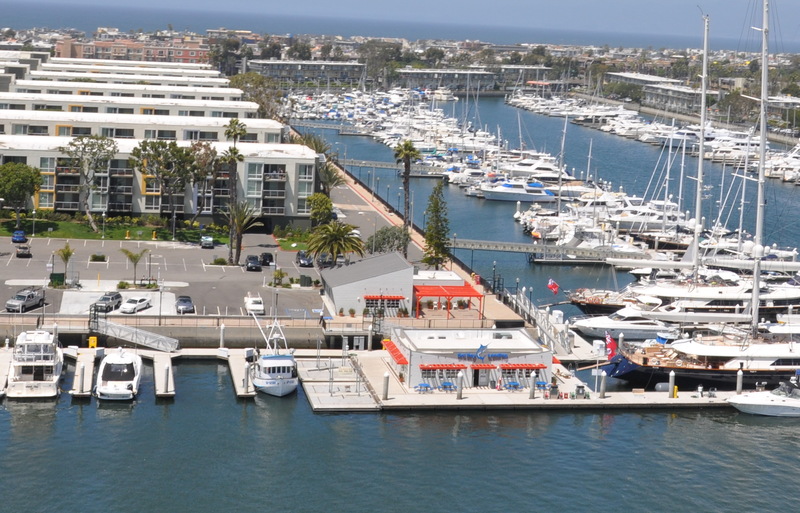 Marina developers often contend with a shortage of land. This can be remedied by placing buildings on the water, creating “land” where there was none. There are three benefits to building on water. First, some functions, such as a harbormaster’s office or a boat rental concession, are better done in the marina. Secondly, pulling up to the dock to buy fuel, supplies and bait is a lot more convenient than having to go ashore. Finally, a restaurant, bar or yacht club has more ambience on water. 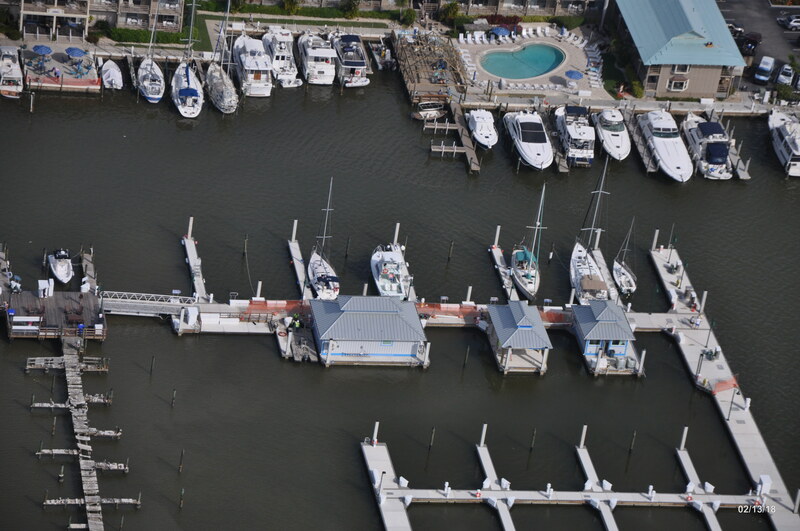 Naples City Marina has three floating platforms that support a dockmaster’s office, gazebo and restroom complex. The latter includes showers and laundry and stands on a 45-foot by 29-foot platform with a built-in drainage system. A gravity fed sump collects waste water and pumps it on shore. Cap Sante Marina in Anacortes, Washington, has party platforms the operator can tow to any point in the marina and position in a slip or side-tie. When equipped with pavilion tents and staffed with chefs and bartenders they provide venues for events from barbeques to wedding receptions. Floating platforms are widely used for sailing schools and dinghy docks, some with driveway-like launching ramps cast into the platform. Others are part of a larger dock with cast-in stepdown to a lower freeboard. Notches can be configured in the platform to facilitate getting in and out of human-powered watercraft. Some have arm rails that make it easier for disabled watersport enthusiasts. College and club crew facilities have been constructed with floating platforms that gradually slope downward from the boathouse to the water. The low freeboard helps launch delicate eight-oar shells with as little drama as possible. “Match-cast” refers to the process of casting one float and then casting its neighbor using the side of the adjacent float as a form. Low-profile shear keys are cast in the concrete that interlock when the platform is assembled. They provide perfect alignment along with tremendous torsional strength. The result is impressive: all gaps are closed and tight; everything fits with precision. Steel rods or stranded cables run through pre-formed ducts from one side to the other and tensioned by a hydraulic ram. Tension is held in place by capping hardware. There are usually multiple rows with at least one row near the top and another near the bottom. The multi-tiered tensioning system resists bending loads more efficiently than a single-tiered system. Any amenity that can be added to a dock can be incorporated in a floating platform. Built-in utility runs protect electrical and plumbing from wear. Sewage systems can be cast in for rest rooms. Wood and other surfaces can be added. Anchors, footings and bolts needed to fix buildings to the platform can be cast in. As an example of floating platform versatility, live bait tanks are built into a platform in California. Once assembled, the platform is essentially a single structural unit. The rock-solid stability on water is uncanny, truly “terra firma.” Large barges with flat “footprints” are similarly stable. Under almost any circumstance short of a tsunami (very long period wave), it is impossible to feel any difference from standing on land. Width is key; stability increases with the square of the width. Platforms greater than 15 to 20 feet wide are essentially rock solid. Under ordinary conditions a tipping force will be opposed by a self-righting force. The exception is a structure with a high center of gravity, such as a two-story or taller building. Stability is easily regained by increasing the width of the platform. The weight of people on platforms is generally not a problem to the engineers, as the load bearing capacity is sufficient under almost any circumstances. Floating platforms can be home to numerous amenities. 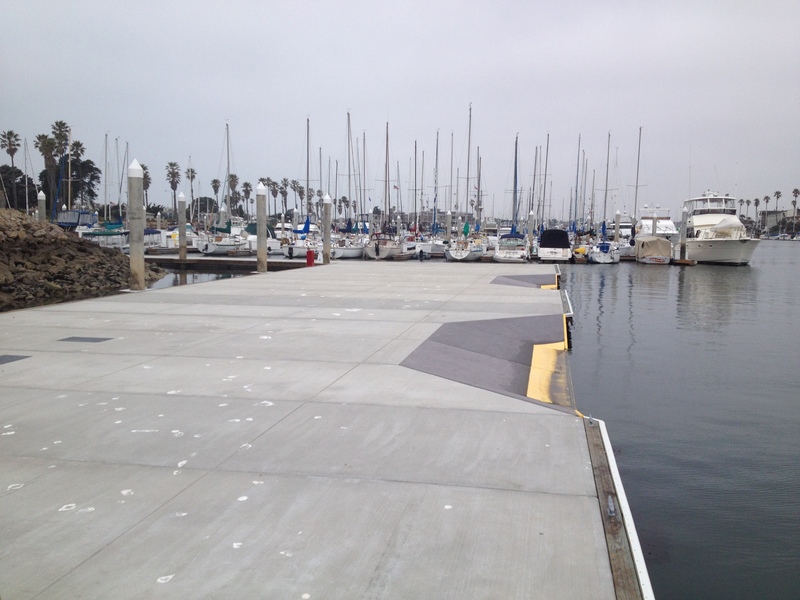 At Marina del Rey in California, a floating platform supports a store and bait pens. The displacement of a floating platform is easy to calculate, as length, width and draft are known. From that one can calculate the volume of displaced water and multiply the result by the water density. Seawater weighs 64 pounds per cubic foot and fresh water is slightly lighter at 62.4 pounds per cubic foot. Archimedes tells us that the weight of the platform and everything on it is exactly equal to the weight of the water displaced. Modules are filled with a precise amount of expanded polystyrene (EPS) so there is no requirement to have pumps in ballast tanks or leveling cells that might rupture and take on water. “If something unexpected happens, we have the ability to balance these structures post production, once they’re in the water,” he said. Hawaii where they were assembled. The platform is 20 feet by 105 feet with a 30-inch freeboard. The Channel Islands Community Association launch dock shows notches cut into the platform. Robert Wilkes writes about the marina industry from Bellevue, Washington.